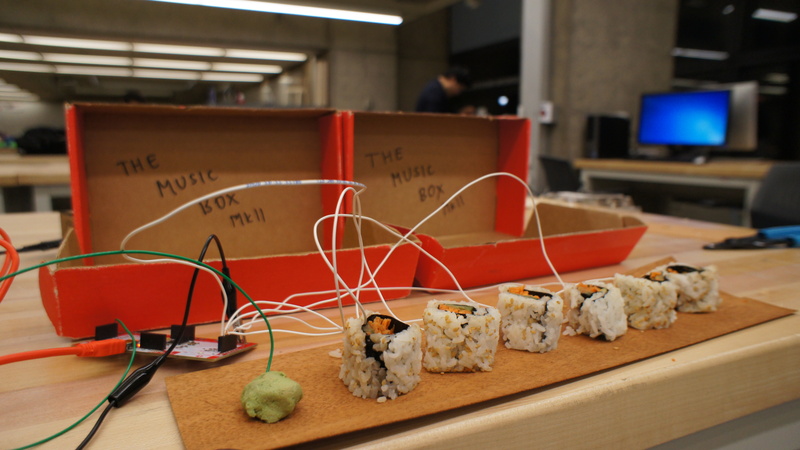 Using the makey makey, I connect up 6 pieces of sushi and some wasabi for some fresh beats. I’ve performed quite a bit with the makey makey, using dumplings, bananas, sushis and little kids for comic effect. In this video, I connect the music output to the Music Box MkII. The idea being that if the makey makey turns anything into an input device, then the transducers used in my previous Music Box project can turn anything else into a speaker! Imagine an integrated system where a user can connect anything to use as an input device and then use anything as a sound output device! This could potentially be developed into an education tool and designed to be self contained in a “sonic exploration box”. Uses a Mad Zach SoundPack from DJ TechTools.